Learning how to play ukulele chords is perhaps one of the most exciting things. The reason for this is that every song you hear is composed of chords, and you’ll often hear the same ones played over and over. These most common ukulele chords is covered here. So as you learn a handful of these basic ukulele chords you will be on your way to playing hundreds of songs and even thousands if you wanted to. How do you play basic chords on the ukulele? You can play basic chords on the ukulele by using your fingers to hold down from one to four notes on the fretboard which make up a chord. There are different chords which are made up of different notes. Each chord will have a different positioning for your fingers on the fret board. The most common chords typically uses two to three fingers. This article will help you learn how to play ukulele chords easily. I’ve put together clear step by step instructions to help you. I hope to make your journey easier while you learn how to play ukulele chords. These basic ukulele chords I will show you in great detail really are the most popular and the most common. There are many ukulele chords you can learn, but the reality is that there are a small amount of them that are most significant. My goal is to save you a lot of time, money, and stress that may come with music lessons. I say this from personal experience. So here you will learn the chords that will help you play over 80% of all ukulele songs. 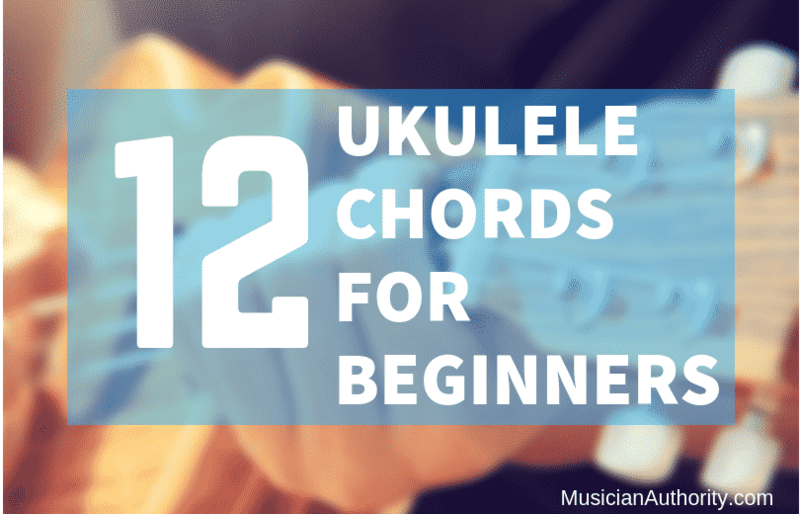 Learning how to play ukulele becomes a lot easier once you know that there are only 12 basic ukulele chords you really need to know to play 90% of songs. There are over 100 chords you can learn, but you would rarely need to use more than half of those if ever. So I’ve sifted through many songs to save you time and have come up with a list of the 12 most popular chords you should learn. After learning these basic ukulele chords you will be able to play almost any song you can think of. Oh, and did I already mention learning to play ukulele chords is really exciting? By the way, be sure to check out the ukulele chords video library. It’s free and an awesome resource for beginners. C is the most popular chord of all time. Whether you play piano, saxophone, accordion, trumpet, the C chord is the most common and most played chord. This applies to any instrument you play and pretty much any musical genre. It’s basically the first chord every musician learns at the beginning stages. By the way, this happens to be the easiest to play of all the ukulele chords! Examples of songs that use C: Somewhere Over The Rainbow, I’m Yours, Let It Go, The Lazy Song, Imagine. Before trying this chord, make sure you know how to tune your ukulele. The most common way to play this chord is simply to place your ring finger on the first string/third fret. The reason for this is that you can easily maneuver if you need to switch to play chords that include notes on the first and second fret for example A chord, or F chord. However, get used to playing this chord with the middle finger also as sometimes it will be a more comfortable position certain cases. For example at the very beginning of Somewhere Over The Rainbow. place your ring finger on the 1st string / third fret. Or using your middle finger may be more convenient depending on the song. G chord is a hugely popular chord as well. Almost as much as the C chord actually. A lot of the popular songs usually use the C chord and the G chord together. So it’s no surprise that G is the next most popular on the list of ukulele chords. Examples of songs that use G: Somewhere Over The Rainbow, I’m Yours, Let It Go, Imagine. Be sure to see my easy ukulele songs article where you can use this chord often. Similar to the G chord, the F chord is widely used together with C. It is very common to see all three of these chords together. So if you’re getting started on the uke, these are the first three basic ukulele chords that you should learn really well before learning the rest. Examples of songs that use F: Somewhere Over The Rainbow, I’m Yours. place your index finger on the 2nd string / 1st fret. A is the chord used in Happy Birthday right after D. If you get this chord, you’ll be able to play songs like Hey Jude, Hey Soul Sistah and other great classic ukulele songs. This one is a classic chord because probably the one you hear when you listen to sad songs like Somewhere Over The Rainbow. This chord is known for giving the sad vibe to songs. Get used to this chord because you will see it very often. The most commonly used flat chord. This one is a must know. The following ukulele chords are just as important as the top 7. These are the minor chords you will see frequently as your learn to play. A lot of songs use these chords to add emotion and feeling. So you will likely see these combined with the top seven major chords we covered already. Well my ukulele friends, I really hope this article was informative for you. My main goal is to help beginner ukulele players and I’m confident this guide will help you learn how to play basic ukulele chords and how to become better. Remember that practice makes progress. Take it one step at a time. Learn a chord really well before you go on to the others. Here’s a really helpful video covering common chords.